One thing I love to do in my free time during nap time, nursing time, bed time, middle of the night time...is to go on Pinterest. I got the new iPhone 6 the other day and for the life of me could not figure out why Pinterest wasn't working! Today it finally came to me that I had to log in to Facebook on the device, before logging into Pinterest. 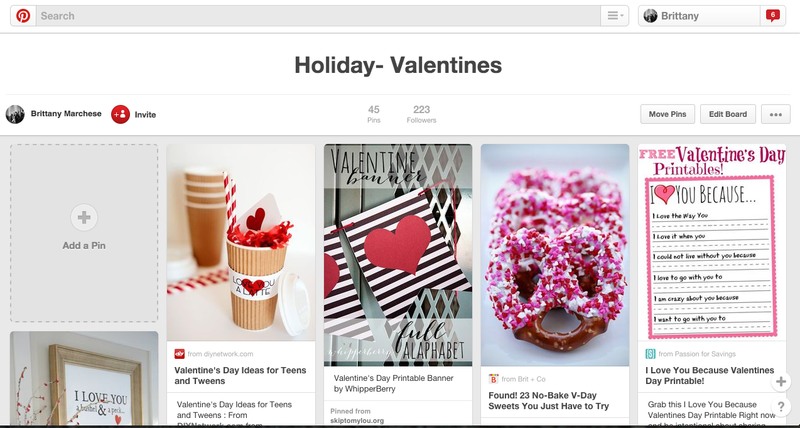 Featured today is my Valentine's day board. I have a lot of boards on my account, feel free to look around and share yours Pinterest Board or Favorite Pin with me using the linky tool below! Visit Brittany's profile on Pinterest.